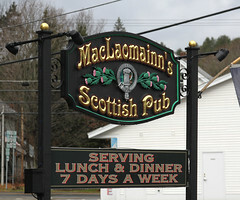 Walking in, MacLaomainn’s has the “Scottish Pub” ambiance down pat, with a small, cozy seating area (maybe 30 seats? ), wood fixtures, maps of Scotland, swords and daggers, and the obligatory tartan patterns adorning the walls (nothing goes with a good Scottish beer than some Black Watch tartan). 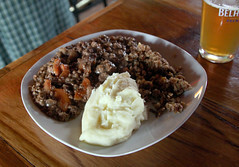 They’ve also got a good selections of beers, ranging from local offerings to several Scottish beers. When I stopped in, this selection ranged from McNeil’s and Trapp representing Vermont, to Orkney and Belhaven representing Scotland. I opted for a Belhaven Twisted Thistle IPA, which I rather enjoyed. Your typical British-style IPA isn’t terribly hop-forward, and that’s the first thing I really noticed about Twisted Thistle: it was one of the highly-hopped in-your-face IPAs like we’ve gotten used to over here in the states. But the rest of the beer was indeed Scottish, using hops and malt profiles much more British-isles in nature (I can’t always places my hops correctly, but this tasted more of Challenger than the Cascade hops used in American IPAs). The result was a fairly pleasant blend of styles, one I’m going to keep my eye out for on other taps around here.